Also will the update take full advantage of my quad dac in my LG v30? @clever__man any idea as to more specific time frame as the last date was missed I understand he's working hard and wants it to be complete and the best product player before he releases it but before you gave a specific date now it's soon can you please find out within the week within the next day or two or next two weeks in August by mid August, etc. as to when it will be released I think it's fair to request this I've not griped about an ETA on the forum before I'm just wondering it would be nice to know thanks Max Andre Clever man androiddd for the info. Yes I would love to know this too! I've been hearing "soon" for 4 years now. This app wasn't free, so for that I think customers deserve more clear communication. I do also appreciate all the effort put into updating Poweramp as well! That's a good question too. Though I myself downsample all my Hi-Res albums to 256-512 kbps AAC, which doesn't sound ANY different than the original Hi-Res resolution it comes in, but takes up much less space and less power to play it. So I wouldn't worry about it either way to be honest. When the final version is completed, it will be released. I paid only once and v3 is essentially a free upgrade for me, therefore I am not going to demand things like ETA or certain customization features just to suit myself along with the selected few. By the amount of demands heard on the forums, Max should really start charging money in order to upgrade to v4. A lot of people seemed to have forgotten that they are getting a free upgrade to Poweramp v3. An app and it's UI, is based on the vision of a developer on how he envisions it, while taking comments into consideration. In my opinion, when an upgrade is free, it is self-entitled to demand anything. 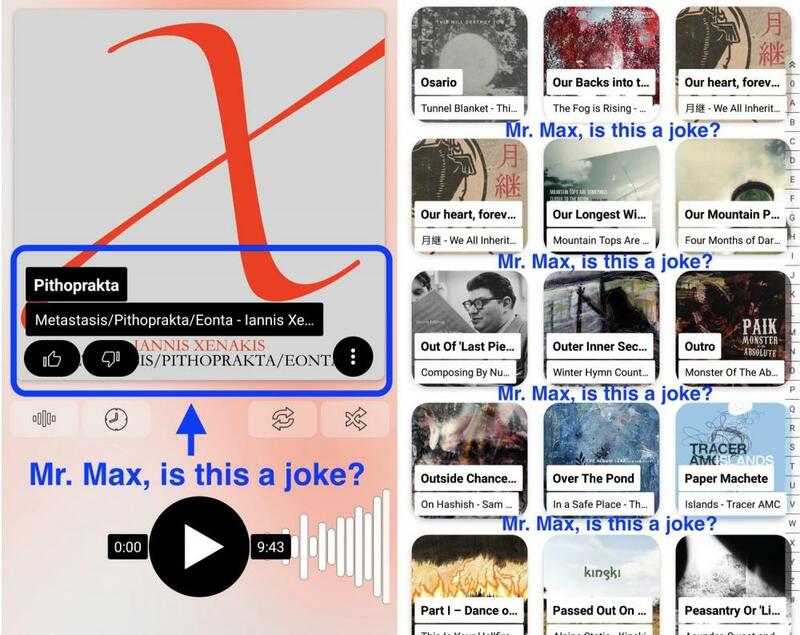 Besides, Max has given the skin makers ability to skin the app UI as their creativity allows them to be. If one cannot live with the current UI, they can wait for a skin that suits them. When will the final version be available? @gusanito007, the final version will be support only Android 5+. I'm still waiting to find out about this too. I just wish they'd release it already. As long as it has the 100-step volume and is stable (parametric EQ would be great too), I'll be happy! To clarify what Max wrote in the first post, some builds using the old (non-material design) interface - numbered 70x - can run on Android 4.4 and earlier. However the final release of v3 requires library features that are only provided for Android 5 (Lollipop) and above. For users of legacy systems (KitKat and lower) the old releases - e.g. 588 - will continue to be available for you to use, but you won't be able to run anything newer than build 709. In Poweramp 3 there is a rare ugliness. [...] But the most important thing is missing: aesthetics, for e.g. silly gigantic song titles above the album covers, horrible thumbnails with exceedingly rounded corners. Years of waiting for this garbage? Ahaha... Bye, bye Max. The best alternative is called BalckPlayer. @BP1, it is just your sily opinion. UI nice and can be extended or changed by skins. You would take a staring at app like BlackPlayer over audio quality? BlackPlayer is not made for listening to music but just to stare at. If you listen to music, then it just does not sound the same as Poweramp. That is the main reason for Poweramp, is the sound. BlackPlayer is never going to update their equalizer or audio settings. Plus, I like the look better than BlackPlayer now. Plus, all this complaining about Poweramps looks still reminds me of Windows Vista time. No one like to take the step to change. Always wanted to stay in the past. Except this is nothing like Vista, just acting like it could be or just do not want to bother trying something new. How do you like technology without change? The only change in BlackPlayer is the looks. All feature updates in BlackPlayer are towards the looks. I will take listening to music the way it should be over BlackPlayer. Thread cleaned of personal insults (plus one valid response to such insults). Final warning: if this continues, the user in question will be removed. One point that I would agree with in this recent discussion though is that text boxes overlaid on top of a small-grid cover artwork layout is somewhat pointless - the boxes obscure most of the album cover, but the wording still can't be seen as it's too big for the space. In my opinion, there really does need to be an option within the main app, not just via skins, to place the title/artist/etc meta info below the cover art rather than obscuring it. Have we confirmed that the latest Poweramp's Hi-Res Output actually works (aka, it completely bypasses Android Audio, or the Snapdragon's lesser quality DAC)? There was some debate about this a few months back that it actually wasn't enabled despite appearing to be. P.S. SO happy V3 OFFICIAL VERSION is finally out!! And that we can move the album metadata OFF the album covers too!!!!!! You'd have to check on your specific device to ensure it's working, on some devices even though the underlying chipset supports high-res, the Android firmware does not. I C. How do I do that? I have the T-Mobile OnePlus 6T. Please see the high-res requests thread for details of how to check. The supported devices thread might help too. I think earlier OnePlus devices did support high-res on some ROM variants, but a search might reveal more. From the Downloads tab at the top of the page, if those betas were ever uploaded and kept anyway, as a few releases happened in quick succession during the testing phases and just replaced other files (709 is the most complete and least buggy with the old-style interface).